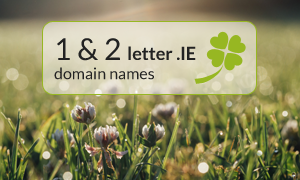 The Landrush phase of 1 & 2 letter .IE domain names starts on 21.02.2016 and ends on March 22nd 2016. During this phase you can apply for your desired 1 or 2 letter .IE domain name by sending us a message using the form below. A non-refundable fee of 250 EUR will be charged for each application, as well as our standard annual fees for .IE domains if the application is accepted. All applicants are required to fulfill standard .IE domain name registration requirements. Please see .IE domain registration page for the requirements and our fees. If more than one application for a certain domain name is received by the .IE Registry an auction will be held and the domain name will be sold to the highest bidder. Domains * Please enter domain names you wish to register. One domain for each line. You can check availability of chosen names after clicking button below (new window). 1 and 2 letter .IE domain names not registered in the previous stages will be released on a “first come – first served” basis for any applicants eligible for registering .IE domain names on April 19, 2016. If you wish to register 1 or 2 letter .IE domain names during General Availability stage, or any other available .IE domain name (3 letters and more), please use the search box located below. Please contact us directly for more information at support@web-solutions.eu.